That Boy Can Teach: It's Just An Emoji! Bah Humbug. It's Just An Emoji! Bah Humbug. Or is it? This won't be the first time I get called a humourless something-or-other: I've written terribly mirthless things before which reveal my sub-humanness and my inability to take a 'joke'. I won't even try to defend myself as someone who loves a good laugh and a joke - you wouldn't believe me anyway if you've already got me pegged. I'm not outraged at this emoji - if you can believe me, I'm not. I just see it as part of a bigger issue, and that bigger issue does do something to me - perhaps I am outraged by the bigger picture I perceive this to be part of. Education doesn't exactly receive good press. The big stories are usually the negative ones. Most government reforms - and they do seem to come with regularity - imply that education is not at its best. Plenty of teachers, for many differing reasons (some justified) don't have much good to say about the profession either. The public perception of teachers and the state of education isn't great at the moment. At least that's the way I see it. This makes education a fragile thing. And all but the most outrageous comedians would pull their punches when it comes to fragile subjects for jokes. Except perhaps when that fragile thing is a what, not a who. All I'm suggesting is that any unnecessary negativity aimed at education might be avoided. One emoji in one chain of high street shops is not exactly the death knell, but it has the potential to play its part. In criminology, the broken window theory says that when smaller crimes are dealt with fewer major crimes will occur. And whilst it's not a crime to make jokes about how terrible going back to school is, it might just be one more little nail in the coffin. I know, I know that I sound like a real party pooper here - maybe I am spoiling all the seconds of hilarity this emoji no doubt generates. But I love my job, and I value education and I wonder if we could do better. 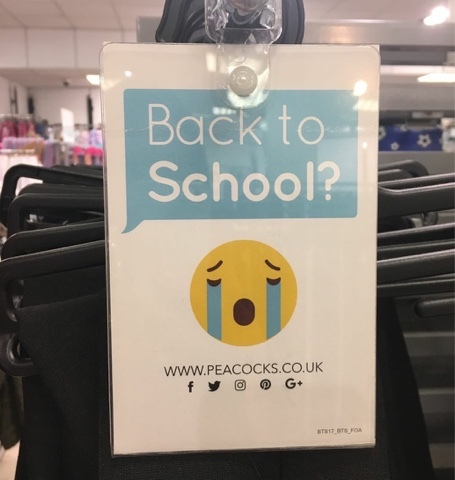 In times when many of us are worried about the mental health of both our students and our teachers, I can't help but question how a teacher or student who has genuinely cried over the thought of going back to school might feel when seeing this. 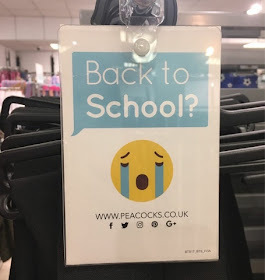 Is the anxiety caused by the thought of returning to school really something to be made fun of? There will, as some have thoughtfully pointed out this week, be teachers who are experiencing genuine stress and depression at the thought of their return to work - that's not something I'd want to belittle. Perhaps it is just an emoji and that it isn't potentially degrading and corrosive at all. There is clearly genuine psychological power in advertising - subliminal messages are all around us and are designed by experts to change the way we think. This one, I'm sure, was just designed to make us laugh and its possible undertones are unintended - I get that - but as part of a much bigger picture, where education is painted as ugly, it's something that I'm sure we wouldn't miss. I don't expect to change minds on this one - we all view things in different ways. My particular outlook is to build up and be positive about education where possible, even on the small things, because I believe even they can make a difference. Yes, this sounds all virtuous and holier-than-thou (maybe this should have been left unsaid) but I'd prefer it if my team of teachers and our children were coming back to school happily come September, not with a sense of foreboding or with tears streaming down their faces. Obviously, they won't - but that'll only be because they're coming back to an awful, humourless teacher and leader who just can't take a joke and removes all the fun from learning.